When I was younger, my aunt and uncle hosted a big New Year’s Day bash. My Uncle Dub made giant pots of jambalaya as well as smaller, separate pots of black-eyed peas and greens for guests to enjoy. I remember that I could eat my weight in my Uncle Dub’s jambalaya! Unfortunately, I couldn’t quite say the same for the black-eyed peas and greens. Wow! I was missing out because I LOVE them both now. I do remember though that we were required to eat at least a bite of each (black-eyed-peas and greens) for luck, prosperity, and good health. Fast forward many years and I finally realized what I was missing. 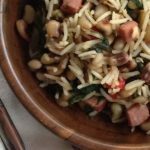 As a nod to so many wonderful memories with my uncle (who is no longer here with us), I want to share my simple New Years Hoppin’ John with Greens recipe with you. Now you to can all of you can also have prosperity, health, and wealth in the new year! Do you have a special recipe or food that you like to make on New Years? Heat oil in a large skillet over medium-high heat. Sauté ham, onion, bell pepper and jalapeño pepper over medium-high heat 5 to 7 minutes or until vegetables are soft. Stir in cayenne pepper and sauté 1 minute. Stir in black-eyed peas, greens, and broth. Reduce heat to medium, cover, and simmer, stirring occasionally, 20 minute or until peas are tender. Serve over rice and stir all ingredients together then top with hot sauce, if desired. Mmm jambalaya and hoppin’ johns… few things are more perfect for a New Years party! I always make a slow cooker soup with black eyed peas, greens, and pork. That sound delish! Happy 2015! I adore Hoppin Johns! Black Eyed Peas are the best! Thanks, Rebecca! I hope you had a happy new year!